Bob and I weren’t able to be together for our one year anniversary this year. Bob was traveling for work, and I was wrapping up exams for University. It was a busy time! So, being thoughtful, Bob sent me a series of presents, one of which was a beautiful cookbook – Salad for Dinner. I remembering thinking how wonderful it was and how I couldn’t wait to make something from it. I hadn’t done that just yet, but this past week I invited my best friend Olya for lunch, creating a perfect opportunity to try something new! 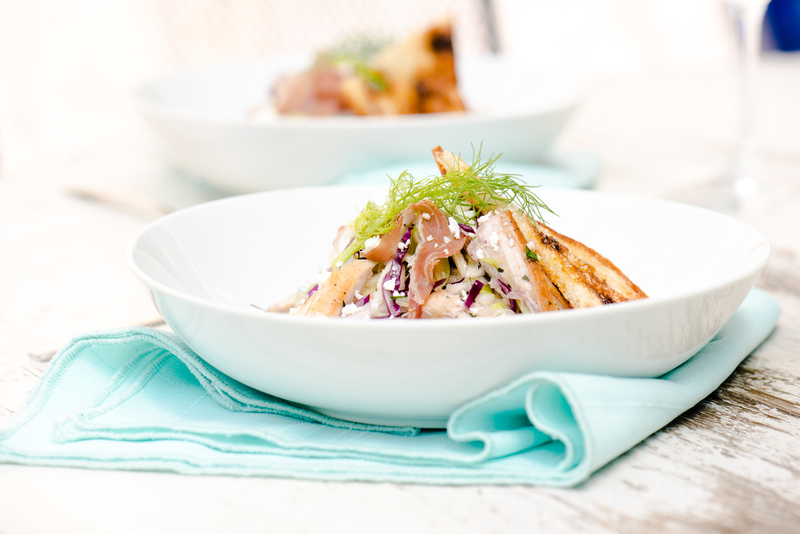 Lately, I’ve been daydreaming about making something with fennel, and this recipe looked like everything I wanted. So many components that I love appear in this salad, including prosciutto, fresh herbs, olives, and feta. Best of all, Olya loves to cook, making her the perfect companion on a warm summer day. She came over, and we immediately got to work, chopping and dividing duties between the three of us. It was everything I hoped it would be, and quick to prep too. 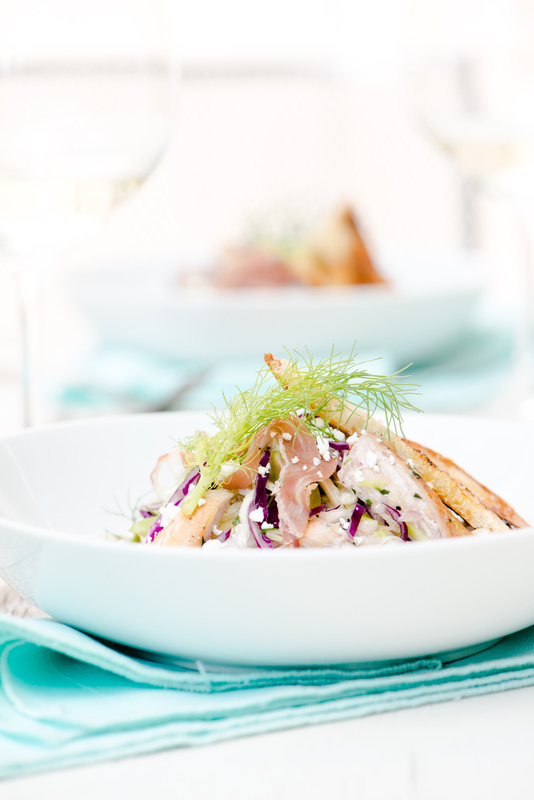 This crisp yet hearty salad filled us up as we chatted on our deck and sipped a semisweet pino grigio. Neither Bob or I are particularly big fans of white wine, so I’m not sure why we had some on hand, but it worked out beautifully! Our oregano vinaigrette complimented the wine so well. 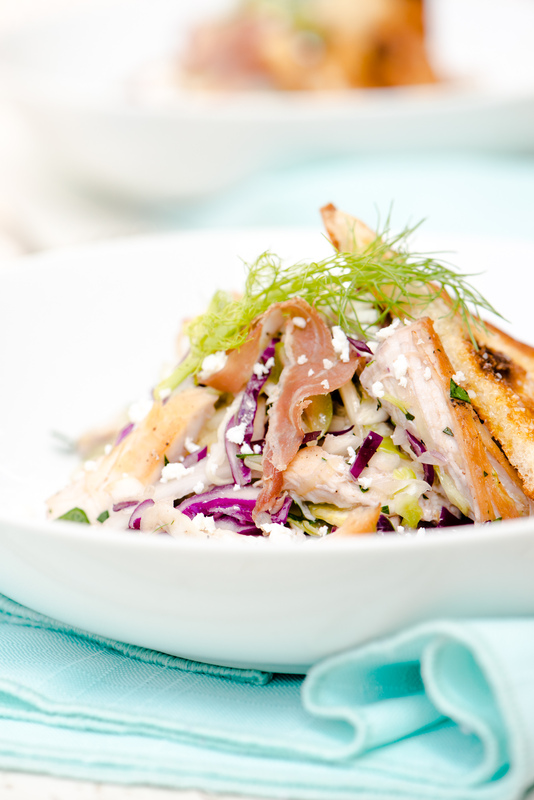 A hearty, fresh summer salad featuring fennel, cabbage, roast chicken, feta, prosciutto, with a Greek inspired vinaigrette. 4-6 pieces of prosciutto, torn in pieces. Combine ingredients for Oregano Vinaigrette, whisking until combined. In a large bowl, combine chicken, fennel, onion, parsley, and olives. Toss with Oregano Vinaigrette (you may not wish to use all of the vinaigrette). Garnish each serving of salad with prosciutto, and feta. Recipe from: Salad for Dinner by Jeanne Kelley. Bob, Olya, and I often joke about how she’s our favorite third wheel, and technically, she was my “boyfriend” before Bob was in the picture. So, when it came time to instagram this post, Bob jokingly changed our hashtag from #theadventuresofbobandshan to #theadventuresofshabolya. I love these two. Sometimes, I think I best curb my wanderlust for life by settling in to cook something. I may not be traveling as much as I long for, but each meal we make, and the loved ones we share it with brings life to our home that can’t be replaced with any other feeling.